Former Argentine President Carlos Menem has launched a new political group within the Peronist party and vowed to return to Argentina soon. Mr Menem, now living in Chile, sent a recorded message to supporters, saying his new People's Peronism group would try to reunite the party. He also accused current President Nestor Kirchner of dividing Peronism in order to create his own party. 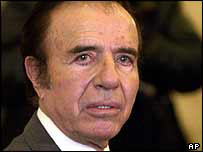 Mr Menem faces possible fraud charges if he returns to Argentina. "Argentina needs a united Peronism to face these difficult times when half our citizens are living below the poverty line," Mr Menem said in his message. He accused Mr Kirchner, to whom he lost in last year's presidential election, of sowing discord and activating "the antibodies of Peronism". "Soon I will be back in Argentina, have no doubt. I will return without fear, to overcome this crisis and bring about the Argentina that we all deserve," he said. The Supreme Court in Chile has recently rejected two extradition requests for the former Argentine president. Argentina filed the requests after Mr Menem repeatedly failed to appear in court in Buenos Aires. He is wanted for questioning over $60m allegedly embezzled from funds for two new prisons and $600,000 of allegedly undeclared funds in a Swiss bank account. There was no immediate comment on Mr Menem's statement by the Argentine government. Argentine newspaper websites' accounts of Mr Menem's declaration have pointed out that the founder of Peronism, Juan Domingo Peron, sent similar messages to his followers during his years of exile in Spain. But with a hint of irony, they add that while Gen Peron used crackly tape-recordings, Mr Menem was able to employ the digital technology of compact disc.